FILE - Protesters perform a simulation of the waterboarding torture technique on a man dressed as a prisoner during a protest, marking the fifth anniversary of the U.S.-led invasion of Iraq, in front of the White House in Washington, March 19, 2008. A global survey has found a major shift in public attitudes toward torture, with growing numbers of people approving the use of this forbidden practice to obtain "important military information." The survey, which was conducted by the International Committee of the Red Cross, questioned more than 17,000 people in 16 countries between June and September about a range of issues regarding the conduct of war. Ten countries in conflict participated in the survey, along with respondents from Britain, China, France, Russia and the United States — all permanent members of the U.N. Security Council, or P5 — and Switzerland. 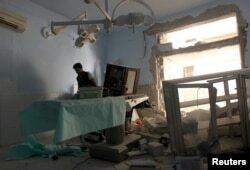 FILE - A medic inspects the damage inside Anadan Hospital, sponsored by Union of Medical Care and Relief Organizations (UOSSM), after it was hit by an airstrike in the rebel-held city of Anadan, northern Aleppo province, Syria, July 31, 2016. The survey found that an overwhelming number of respondents in both groups of countries — 80 percent — believed that wars should have limits, that combatants should not target civilians, and that combatants should avoid striking civilians as much as possible when attacking the enemy. The survey said the same number "thinks attacking hospitals, ambulances and health care workers, in order to weaken the enemy, is wrong." Peter Maurer, the president of the International Committee of the Red Cross, said he was encouraged by the responses, but was troubled that the number of people who considered torture a useful tool had increased since a similar survey in 1999. "The percentage of those who think it is acceptable to torture a captured enemy combatant in order to obtain important military information has risen from 28 to 36 percent today in the poll," he said. "Even more shocking, only slightly less than half of the people — 48 percent as of this year — believe this behavior is wrong compared to 66 percent in the 1999 survey." An analysis of the data shows that people in the United States and Israel were among those most willing to accept torture as a part of war. Both of these countries, with 46 percent and 50 percent of their respective populations approving of the use of torture, were behind Nigeria, which polled 70 percent, but higher than Iraq, Afghanistan, the Palestinian territories and Britain. "Torture is wrong," Maurer said. "It achieves nothing apart from pulling everyone down in the darkest gutter. We demonize the enemy at our peril. It brutalizes societies for generations and must be made taboo." Torture is forbidden under the Geneva Conventions, which set out the rules of war, and international human rights law. The controversy erupted during the U.S. presidential campaign when President-elect Donald Trump promised "to bring back waterboarding." Last week, the ICRC president was in Washington, where he took part in many discussions with the current administration, congressional, military and security officials, as well as people likely to become members of the Trump administration. "I have not felt any appetite whatsoever to go back on the issue of torture and to change the policy in this regard. I did not find any advocate," he said. "Many thought that this was a debate, which was over and a place to which the United States would not return." Maurer, who recently also held discussions with officials in Russia, told VOA that he did not find any military personnel either in Moscow or Washington who thought "that torture works." FILE - President of the International Committee of the Red Cross (ICRC) Peter Maurer speaks at a news conference in Moscow, Russia, Feb. 24, 2015. He said torture "is not only morally wrong, but also not effective with regard to finding out the truth. That is the basic line you get in Moscow and in Washington, which is encouraging." In another important finding, the survey indicated that in P5 countries, an increasing number of people were more resigned to civilian casualties and believed that suffering was an inevitable part of warfare. This was in stark contrast to what was gleaned from people living in countries affected by war, 78 percent of whom said it was wrong to attack enemy combatants in populated areas, "knowing that many civilians would be killed." In P5 countries, only 50 percent of people said it was wrong. Maurer observed that the closer people were to the front lines, the more they believed in the relevance of international humanitarian law and respect for it. Separately, "the more you watch wars only in movies and on screen and you are far away from the battleground," he said, "the more casual you become with regard to fundamental provisions of international humanitarian law — again like torture, attacking civilians, accepting collateral damage in a military operation." Maurer said the survey showed an increasing number of people living in P5 countries appeared to be resigned "to casualties and ill-treatment" as an inevitable part of warfare. "Living far from the realities of warfare makes it easier to be disconnected" than it is when faced with "constant gruesome images from the world's front line," he said. Maurer said the main takeaway for him from this survey was that "we must not lose our empathy and become numb to human suffering."